The Rapa Nui table lamp lives with a spirit of lightness. A strong design with the delicacy of hand-blown glass, Rapa Nui is a refined table lamp with mirrored effects. The lamp's gold and steel finishes give it its reflective and elegant nature. 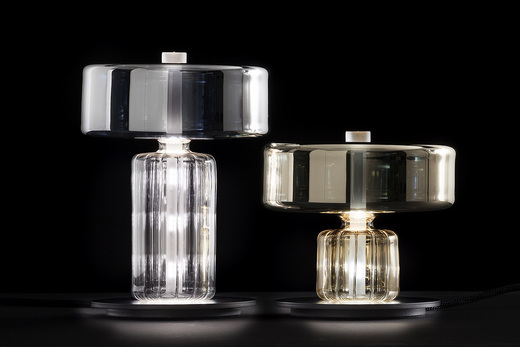 A triumph of solidity with the touch of lightness of hand-blown glass, the fixture is available in small (15 - ø 18 cm) and large (24 - ø 18 cm) and in two finishes, metallized gold or silver, on a metallic varnished base. Rapa Nui was made in Italy and designed by Massimo Crema and Ermanno Rocchi. Melogranoblu products, such as the Rapa Nui table lamp are available in the U.S. at SpaceLighting.com.